John Armstrong’s paintings are an enigma. Over a period in which many artists turned to abstraction, Armstrong remained firmly figurative, yet his spaces are hard to define and his symbolism elusive. 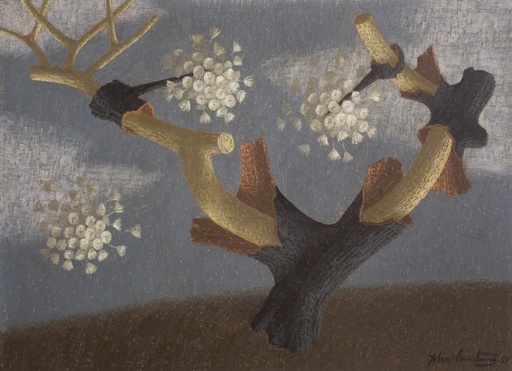 Perhaps best known for his participation in the short-lived movement ‘Unit One’, founded by Paul Nash along with Barbara Hepworth, Ben Nicholson, Henry Moore, Wells Coates and Herbert Read in 1933, and his powerful paintings inspired by the Spanish Civil War, Armstrong was a surrealist in all but name. 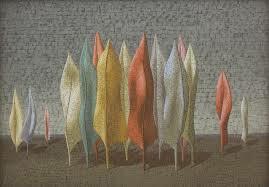 He claimed that what he painted appeared to him in dreams – ‘these things come to me as complete images, often when I am half asleep’ he wrote in 1953 – and an obvious comparison is De Chirico, whose uncanny style permeates the eerily silent spaces populated by anthropomorphic figures and empty, often Classical, buildings (‘Feathers Conclave’, 1946, below). Piano Nobile presents a concise selection of paintings from Armstrong’s most prolific – and experimental – years. Beginning in the late 1930s the works span an eclectic variety of themes, media and techniques. The earlier work is painted primarily in quick-drying tempera – ‘a medium for those who have made up their mind’ in Armstrong’s words – yet there are a number of superb examples which show him to have been an equal master of oil paint. 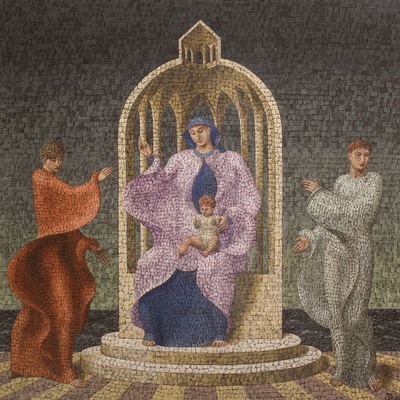 He also veered from flawlessly smooth surfaces to a distinctive mosaic effect, square dabs of paint like tesserae creating the same visual effects that Pointillism sought. In conjunction with religious subjects (to which Armstrong, son of a parson, returned repeatedly) this technique appears imbued with the hieratic symbolism of the Hagia Sophia or St Mark’s in Venice (‘Madonna’, 1945, above). Elsewhere, political themes are uppermost – especially the threat of war which perpetually hung over Armstrong’s life and career. 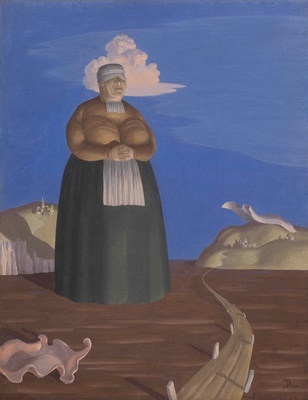 His figures are anonymous and unseeing, standing in a deserted post-apocalyptic landscape; in ‘Encounter in the Plain’ (c.1938, top left) the loss of the Spanish civil war is made explicit in the tombstones lining the roadside while the head of an enormous blindfolded woman is literally in the clouds, while the post-war ‘Figure in Contemplation’ (1945, below), with its single shrouded form, is suffused with a ‘melancholic absence’. 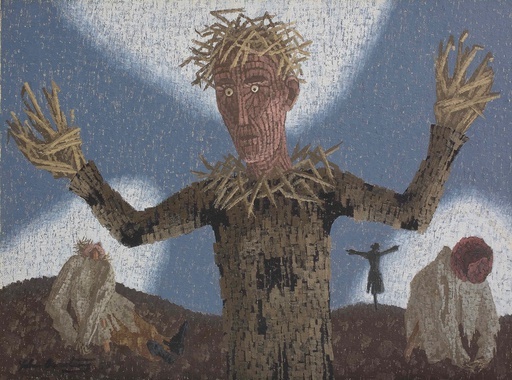 A later Cold War era work, ‘Victory’ (1958, below), is arguably the most arresting image in the exhibition: a wildly staring scarecrow figure lurches towards us, arms akimbo – ‘the central figure is a parody of a human being – half-human scarecrow. He’s the winner of a nuclear war. the crumpled lumps at either side – they’re the losers…’ described Armstrong. Yet another scarecrow in the background might be taken as an image of the crucifixion, promising a kernel of hope amidst the ashes of civilisation. 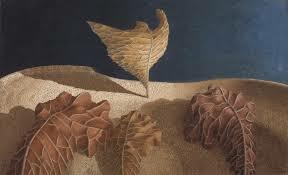 But just as often Armstrong’s figures morph into leaves or feathers, standing enrobed and statuesque in those empty landscapes, or caught in an esoteric dance (‘Leaf Forms’, 1947, below left), the animated still life weighted with a complex and layered symbolism reminiscent of Magritte’s surrealist canvases. The exhibition’s accompanying catalogue illuminates the other side of Armstrong’s career. 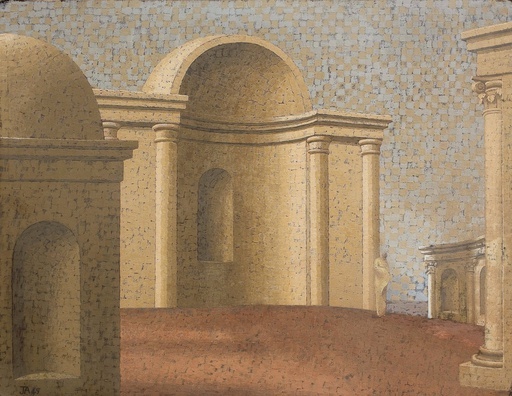 His work as a society muralist and designer of sets and costumes for film, theatre and ballet (including Alexander Korda’s ‘The Scarlet Pimpernel’) is visible in the way he constructs a deceptive sense of space and depth; his knowledge of classics and service in the Royal Field Artillery in Egypt and Macedonia during World War I helps to explain his predilection for archaic and classical themes. In the late 1950s Armstrong’s second marriage to a much younger woman produced the joyful ‘Thorn and Seed’ paintings (1958, below), while during these same years Armstrong was also associated with the ‘Geometry of Fear’ artists (Henry Moore, Lynn Chadwick, Bernard Meadows, Eduardo Paolozzi) – a term coined by his Unit One associate Herbert Read to describe a new Cold War era imagery belonging ‘to the iconography of despair, or of defiance’. Like many British artists who reached maturity during the interwar years Armstrong has been somewhat overlooked; this must be attributed to the lack of a strong group aesthetic – there was no ‘Cubism’, ‘Futurism’ or ‘Camden Town’ that by style, subject or location could unite these disparate artists, as the rapid dispersal of Unit One proved. Each with a uniquely innovative vision, they could not be yoked together. Armstrong’s work assimilates the fear of war and hopes of fresh beginnings in contemplative yet unsettling compositions – it speaks of timeless truths and warnings that are equally applicable today. It is certainly time for a reappraisal.